eight + = 13 Required Please enter the correct value. Mohammed bin Salman – or MbS, as he is commonly known – is Saudi Arabia's crown prince. Once King Salman bin Abdulaziz Al-Saud, who is 81, dies, bin Salman will become the next king of Saudi Arabia. But Mohammed bin Salman's ascent to become crown prince wasn't part of the ordinary line of succession. 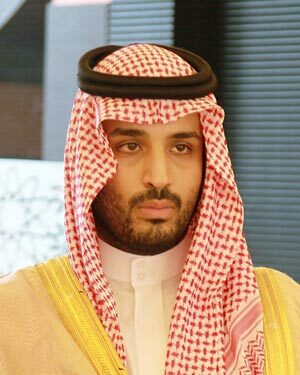 In fact, at just 31 years of age, bin Salman deposed the King's nephew in June to jump next in line to the throne. The unexpected change in succession ended with the King's nephew – and former crown prince – held under house arrest at his palace. As bin Salman flew through the ranks of Saudi power, he also took control of the Saudi Council for Economic and Development Affairs in 2015. That included a grant of power to control Saudi Aramco, the world's biggest oil company, the same year. Less than a year later, in January 2016, bin Salman announced that Saudi Arabia would sell shares of Aramco in what could be the most anticipated, and largest, IPO of all time. 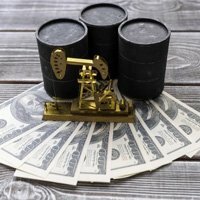 Money Morning Global Energy Strategist Dr. Kent Moors says Aramco's massive $2 trillion valuation "makes the Aramco IPO uniquely important in the history of stock markets." But bin Salman's decision "has come at the cost of some internal friction with officials at Aramco, who remain unsold on moving away from selling crude as the bedrock of the nation's economy," says Moors. Why Is bin Salman Pushing Aramco to Go Public? As the head of Saudi Arabia's Council for Economic and Development Affairs, Mohammed bin Salman is steering the country toward a more diversified economy. That means cutting Saudi Arabia's reliance on oil sales. But to do that, the country needs money to invest in different economic sectors, and bin Salman found it in the sale of the Saudi "crown jewel." That's how bin Salman pitched it to the The Economist during a Jan. 6, 2016, interview. "I believe it is in the interest of the Saudi market, and it is in the interest of Aramco, and it is for the interest of more transparency, and to counter corruption, if any, that may be circling around Aramco," bin Salman said. One official called the Aramco valuation "unrealistic and mind-blowing." Mohammed bin Salman's announcement was so surprising, even Aramco employees were caught off guard. Prior to The Economist interview, Aramco employees were not aware of a potential IPO, and even told Fortune a month later that the Aramco IPO was "absolutely unthinkable." That suggests that, while bin Salman claimed the Aramco IPO was "something that is being reviewed" during his January 2016 interview, Aramco employees were left out of the process. That could have been meant to "counter corruption," but it also means the 29-year-old was making the decision without the company's full support. The $2 trillion valuation has helped fuel the hype around the Aramco IPO, and it's why a public offering of 5% of Aramco is expected to shatter records. A 5% sale could raise $100 billion, four times as much as the current largest IPO. Alibaba Group Holding Ltd. (NYSE: BABA) holds the record for raising $25 billion during its 2012 IPO. But the $2 trillion valuation isn't holding up to scrutiny, especially as oil prices struggle to remain above $50 a barrel. In fact, The Wall Street Journal reported in April that Aramco officials couldn't come up with a scenario where the valuation was over $1.5 trillion. A $2 trillion valuation might have made sense in 2014, when Brent crude traded over $115 a barrel. But oil prices are down sharply since then. Brent crude currently trades at $56.24 a barrel, near its 2017 high of $57.10 and 8% above its 50-day moving average. And Brent prices were as low as $29.25 a barrel in January 2016, when the IPO was first announced. The low cost of oil led Bloomberg to report the Aramco valuation might be closer to $1 trillion today, half the amount bin Salman claims. And Rystad Energy, an energy research firm, pegs the valuation at $1.4 trillion on the assumption oil prices rise to $75 a barrel. According to the WSJ report, "some of the Aramco team members are concerned because their calculations have consistently yielded lower numbers than the one the prince disclosed." While a valuation over $1 trillion is still extraordinarily high, the amount investors are actually willing to pay for Aramco stock will determine how much money the government raises from the IPO. A lower-than-expected price – especially half the expected revenue – would be a significant blow to bin Salman's plans. Since Aramco is owned by the Saudi government, there was never a need to keep the two separate. But in order for Aramco to go public and list on a stock exchange, especially one like the New York Stock Exchange, the company needs to be completely separate from the government. That's proving to be more difficult than expected when bin Salman announced the Aramco IPO plans back in 2016. It could also push the IPO date into 2019. Simply, the IPO could lead to Saudi state secrets becoming public knowledge. The government solved a relatively simple problem this spring when it slashed the tax rate on Aramco to just 50%, down from more than 90%. This was a formality to show investors the Saudi government would be allowing Aramco to keep more of its profits. That makes it a more attractive investment for potential buyers. But the entanglements go even deeper, and that's what's currently slowing down the IPO. "There has been an ongoing disagreement within both the government and the leadership at Aramco over where the IPO should be issued," Moors said. You see, Saudi Arabia is the world's largest oil-producing country, and it has the third-largest oil reserves in the world. And since oil makes up 92.5% of Saudi Arabia's budget, it treats its oil as part of its national security. But listing Aramco on a Western stock exchange, like the NYSE or London Stock Exchange, means Aramco will have to publicly disclose everything relevant to investors, including its oil reserves, locations, and oil pumping capacity. Simply, the IPO could lead to Saudi state secrets becoming public knowledge. Officials are now working to distance the company from the government, including an announcement that the government will retain control over the oil reserves. The LSE is also floating a special plan that will allow Aramco to list on the exchange without disclosing sensitive information. The difficulty is another sign that Mohammad bin Salman's decision to take Aramco public wasn't as carefully planned as it first appeared. The fact that the project continues to move forward despite the mounting obstacles is also a sign of his growing power as crown prince. But if Saudi Arabia hopes to diversify its economy, it will need the money that can only come from the world's biggest IPO. 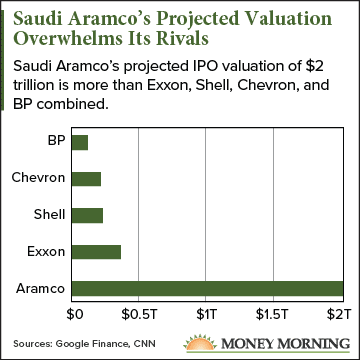 And because Aramco has unrivaled access to Saudi Arabia's oil, investors will be eager to own a slice of the company. We'll continue to follow this IPO closely. In the meantime, Moors has found a way to profit from Saudi Arabia's changing direction on energy.